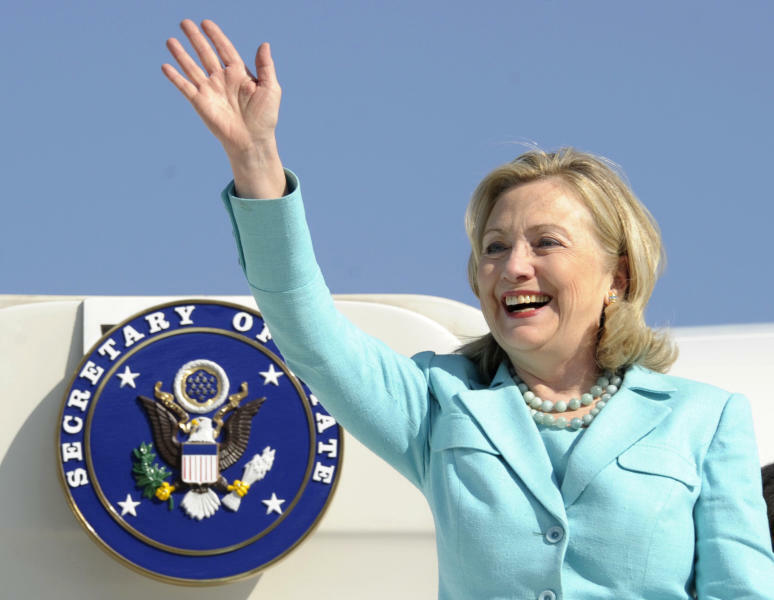 WASHINGTON (AP) — If diplomatic achievements were measured by the number of countries visited, Hillary Rodham Clinton would be the most accomplished secretary of state in history. While historians will debate and eventually rate her tenure as America's top diplomat, Clinton is already assured of a place in the State Department record book. When her plane touched down at Andrews Air Force Base outside Washington early Tuesday morning, the former first lady completed an epic 13-day journey of 27,000 miles — about 2,000 miles more than the circumference of the Earth — through and over Europe to Asia and then doubling back to the Middle East. One well-traveled Clinton staffer described the France-Afghanistan-Japan-Mongolia-Vietnam-Laos-Cambodia-Egypt-Israel itinerary as "especially absurd, even for us." 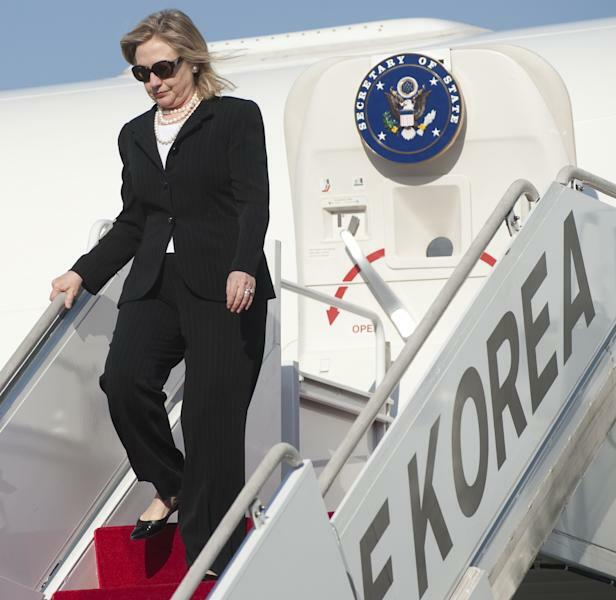 Despite the mind- and body-numbing time zone hopping, Clinton joked that she was ready for more. "I appreciate being here, I am only sorry that I have to leave," she told reporters on her last stop Monday, in Israel. "My traveling team is anxious to get home. I'd like to be hanging out in Jerusalem, but, you know, I have to do my duty," she said with a sigh. 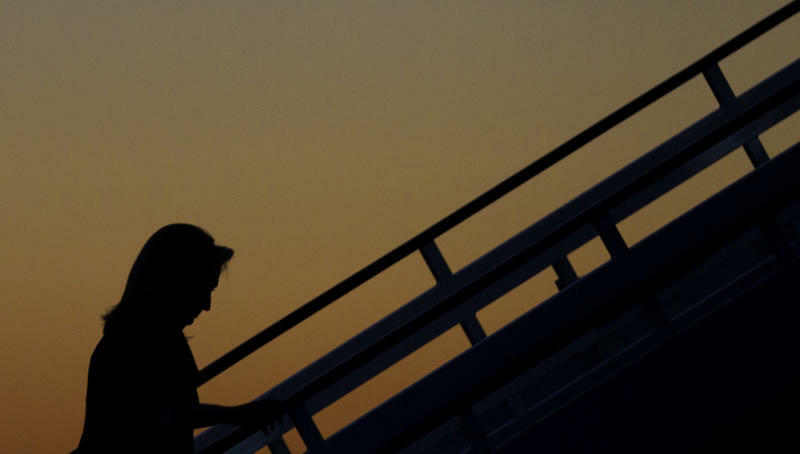 Since becoming secretary of state in 2009, Clinton has logged 351 days on the road, traveled to 102 countries and flown a whopping 843,839 miles, according to the State Department. While some previous secretaries may have flown more miles — mainly due to shuttling back and forth to the Mideast on peace missions — none has visited more nations. Clinton broke that record last month, eclipsing Madeleine Albright's total of 98, when she traveled to Finland for number 99 and then hit the 100 mark in Latvia. Not content, she tacked on another two countries — Mongolia and Laos, where she was the first secretary of state to visit in 57 years and only the second ever — on her latest trip. And she has another six months to go before she reaches her self-imposed deadline to step down and take a breather. Even with a bed on the plane and her uncanny ability to sleep mid-flight, the grueling schedule can take its toll. Clinton suffered a rare coughing fit as she finished a speech before the U.S. Chamber of Commerce in Hanoi. And while she insisted that she would have preferred to stay all day as birds sang in Kabul's presidential place, she rushed away when Afghan President Hamid Karzai suggested taking additional questions. Arriving in Egypt this weekend after a flight from Cambodia, Clinton and her staff literally didn't know what time it was. BlackBerrys automatically reset their times to what should have been Cairo time, except it wasn't, so the staff set their clocks to Sarajevo time. Several hours later, the reason for the discrepancy was discovered: Egypt opted out of daylight saving time this year. Clinton tells anyone who asks that she won't be staying on if President Barack Obama wins a second term — not surprising, given that only one secretary of state has served more than four years since the 1970s. And after a bruising fight with Obama for the 2008 Democratic presidential nomination, she likes to say she won't be returning to the political stage. But with her popularity at an all-time high and the Democrats in likely need of a 2016 candidate regardless of whether Obama is reelected, there is widespread speculation that she would find a second stab at becoming first female president irresistible. First, though, she'll need a nap.